My son and I recently tested out a scenario for Sellswords and Spellslingers. 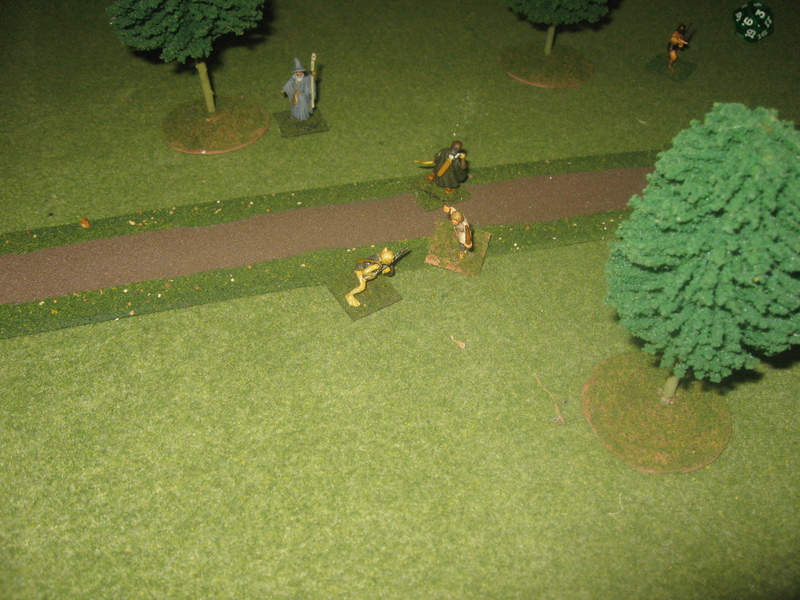 It is an adaptation of the fantasy scenario from Don Featherstones Skirmish Wargaming book. I was originally going to use one group and we would take a couple of characters each but he, instead made a “super” ranger of 40 points so we played as 2 players and upped the firepower a bit. The game is played on a map that has a road going north south. There is a goblin raiding party on the road with the stolen gold. The object? To recapture the gold and move it off the map along the road north. The player may split the party, entering half from the south map on the road while the balance remain on the road to the north. The goblins are setup with a goblin hero (we used the stats for the orc brute but hobgoblin might be better) a horde of 3 goblin archers and a horde of 3 goblins carrying the treasure. Below is an overview of the map with the setup. Looking from the North end of the road. The goblins may move when the appropriate card is drawn. 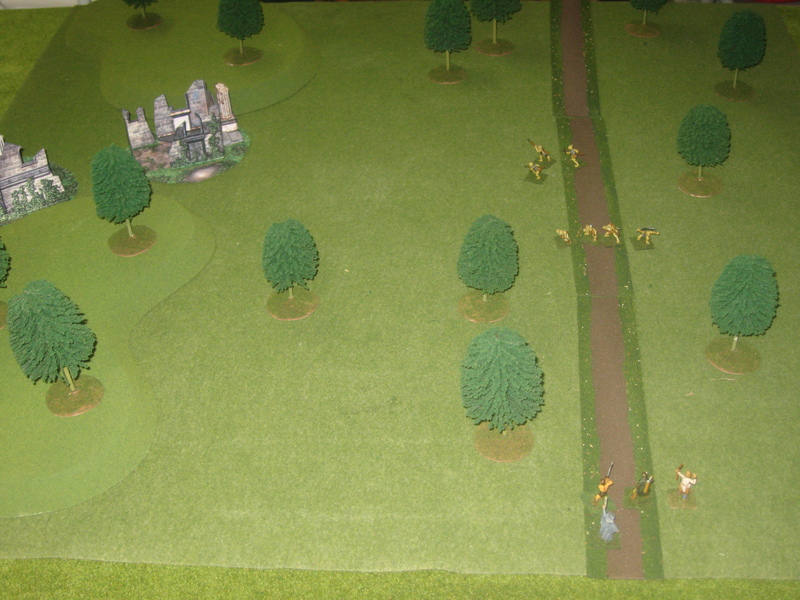 The treasure bearers will move directly toward the Southeast corner which is the direction of Goblintown. Peter Jackson made me name it! There is a scenario event. If the event card is drawn, a troll appears in the ruins. He is a rather intelligent troll and moves like most other monsters, not randomly moving about when characters are near. The game played well enough despite some bad luck on my part. The enemy battle line. I seem to have cut off the treasure bearers. The ranger in the south. Not a great shot. This guy was 3D printed. 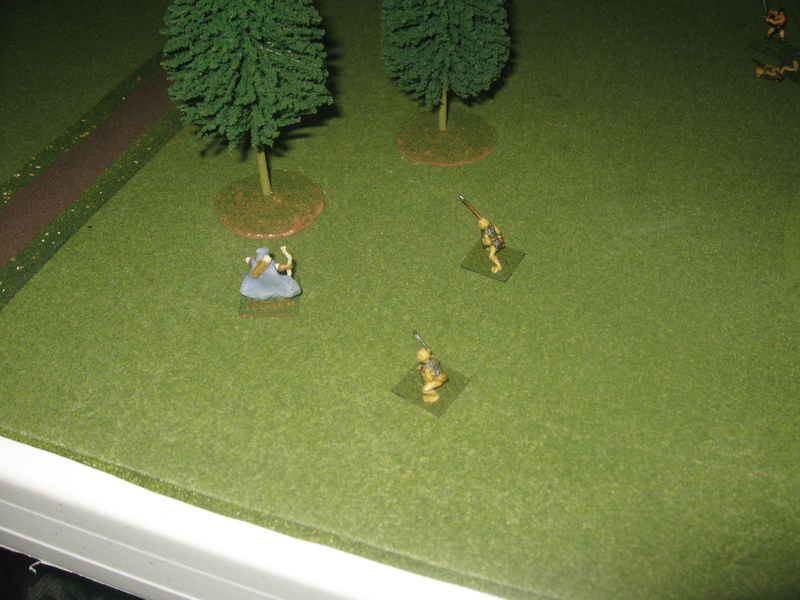 The ranger was beset upon by a couple of goblin groups including one 5 member group. Jack had to move away and then start sniping. 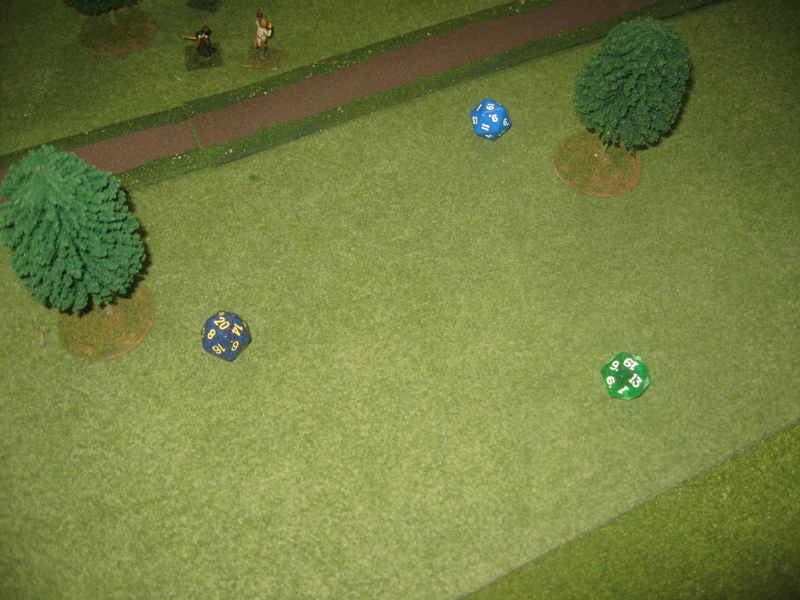 The northern group, my characters seemed to roll either 0 or 1 action on 2 dice which meant that I started the game with a prolonged melee. 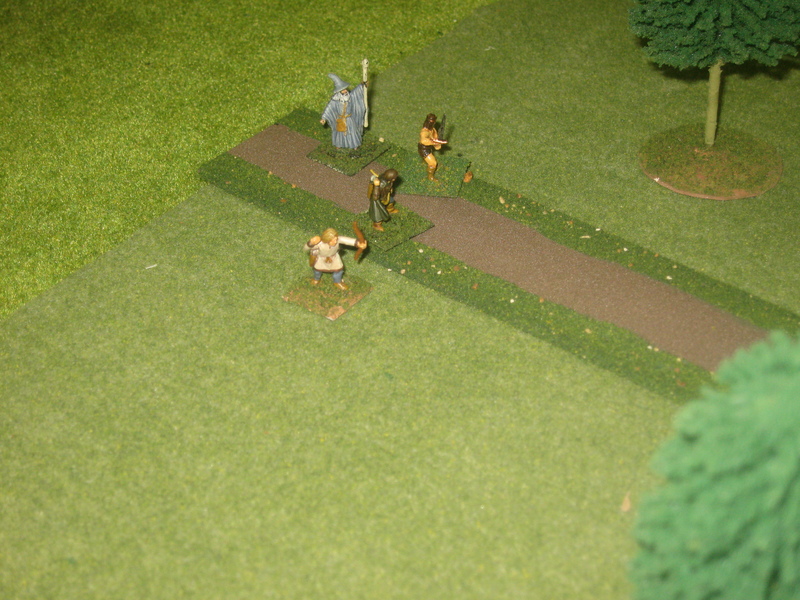 Cleaning up, this was the last of about 6 goblins in 3 groups. The last of Jack’s goblins. 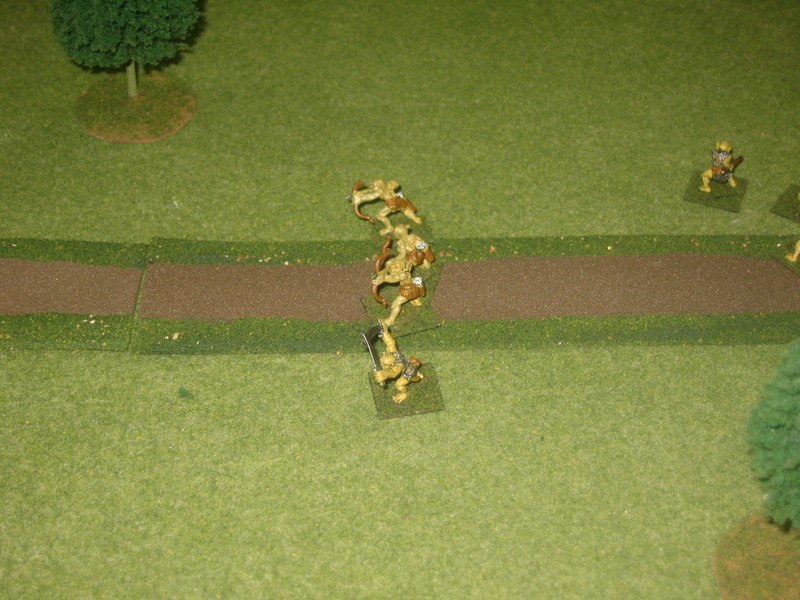 These were a horde but one had 2 hit points (a random event) so split off from the main body. While Jack was finishing off the southern horde, I sent my barbarian to finish the treasure bearers. The barbarian had a penalty of 1 on movement for being laden with treasure. The troll emerged from the ruins (scenario event card drawn) and the chase was on. I decided to roll all 3 dice. 4 actions! That makes up for all those failures I rolled early on. The barbarian RUNS for safety! JTT trees. Hills are from some old company who made GW style hills. The tower was purchased from Michael’s. 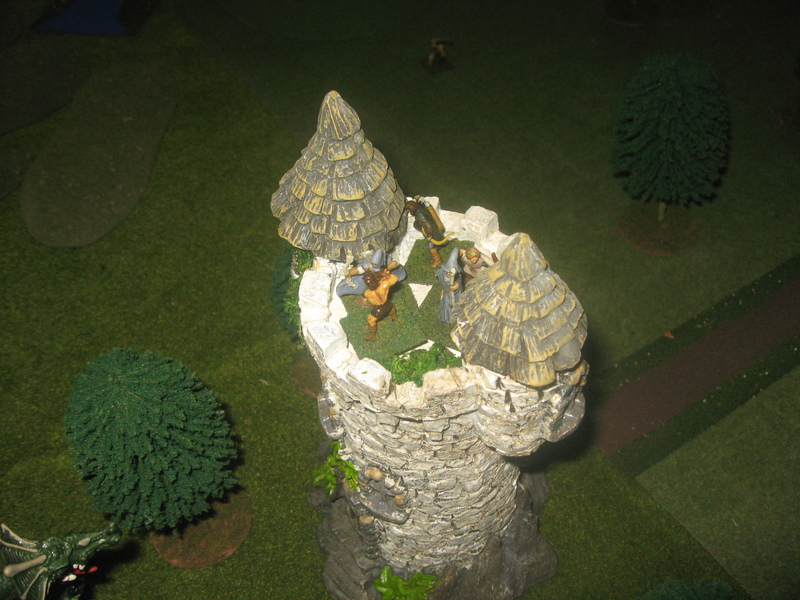 The ruins are Microtactix card stock buildings. The roads were made by a gent selling these at the flea market at Cold Wars. The troll is GW. The game figures in the north are mostly Caesar with the goth archer from New Line designs 1/72 scale Goth range. The ranger is a scaled down 3D print of Dutchmogul’s 28mm ranger on thingiverse. The goblins are from Goblin factory, now carried by an Australian company (I think). This entry was posted on Monday, December 17th, 2018 at 6:39 pm and is filed under Fantasy, LotR 20mm. You can follow any responses to this entry through the RSS 2.0 feed. You can leave a response, or trackback from your own site.